Buying flowers should be a joyful experience. You might picture yourself in a charming florist’s shop, surrounded by exotic color and beauty, ready to make a purchase. But so often, scoring a bunch of flowers for your sweetheart or your mom is just stressful—especially for a special event or Valentine's Day. Which flowers look good together? Where can I buy flowers near me? Do I need to get them delivered? How far in advance do I need to order? How much is a bouquet supposed to cost, anyway? We get it. Luckily, there’s a way around all that worry—buy the flowers at your local Trader Joe’s. How much do Trader Joe’s flowers cost? If you didn't order ahead from a fancy florist, Trader Joe's sells bunches of roses inexpensively, and you can pick them up at your local store, often at the last minute. If we’re talking Valentine's Day roses, Trader Joe’s is the best deal around. 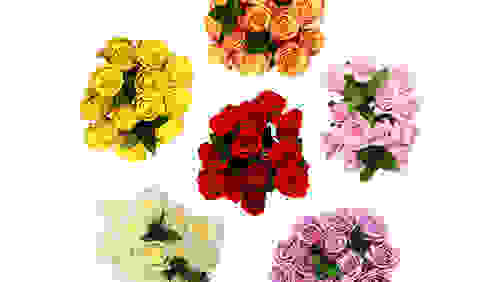 For $12.99 a dozen you can select a rose bouquet in your loved one’s favorite color. 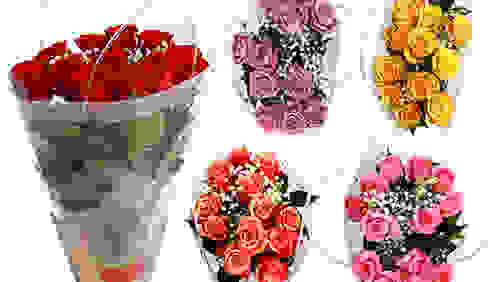 That’s a good value—in February, the prices for roses at fancier flower stores can be nearly three times as much. Affording those can be a thorny problem. Of course, a bouquet of Trader Joe’s roses is pretty bare bones. The store will be happy to sell you a dozen roses in a vase with baby’s breath (those frothy little white flowers) and ornamental greens, for which you’ll pay an extra $5. The giftee might have her own vase, though, and that spray of baby’s breath can look too “wedding-y” for your loved one’s taste. No pressure, of course. For $5 more than an unembellished rose bouquet, Trader Joe's offers a rose bouquet in a vase with baby's breath and greenery. It could make a sweet Valentine's Day presentation. What if I don’t want roses? Trader Joe's sells a bouquet of 24 tulips. Each bouquet is a single color. If your relationship is casual, or you've just started dating, a gift of roses might seem over the top. Trader Joe’s offers very reasonable deals on other flowers. 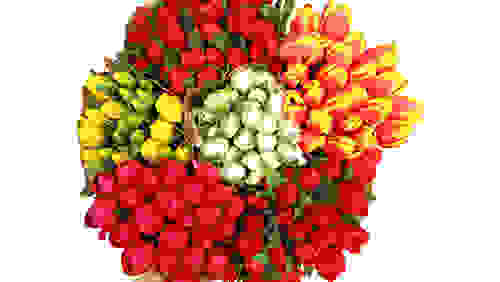 Their Double Dozen tulip bouquets are happy harbingers of spring, and at $10.99 for 24 flowers, you can’t beat the price point. The store’s other flowers are pretty too. When we did a test at Reviewed to see how long we could keep cut flowers alive, we started with a couple of Trader Joe’s mixed bouquets ($10 each!) to experiment with. With minimal effort, they lasted for a week—pretty good for a $20 investment. If you want to gift a substantial bouquet, you could buy a couple of bunches and make your inexpensive flowers look high-end. It's easy: remove the plastic, wrap the two bouquets together in brown paper, and tie them up with ribbon. Guaranteed that will make a nicer presentation than you thought possible. How long do Trader Joe’s flowers last? In our experience, Trader Joe’s flowers can stay in good shape for at least a week, but that depends on how you care for them. When should I skip Trader Joe’s flowers? Trader Joe’s carries orchid plants for a reasonable price (we've seen them there for $12.99), but if you want to buy some truly exceptional flowers, you may not find them there. If your mom lives in a different state and you want to send her flowers, you'll have to go elsewhere. Trader Joe’s doesn’t deliver. If you want to have flowers delivered, you'll have to buy them elsewhere. Trader Joe's doesn't deliver. A colleague of mine at Reviewed gets a monthly arrangement of fabulous flowers delivered from The Bouqs. Her boyfriend picks them out, and they come to our newsroom on the regular. These are not ordinary flowers—they’re grown in far-off spots like Colombia and Equador—and they’re irresistible. 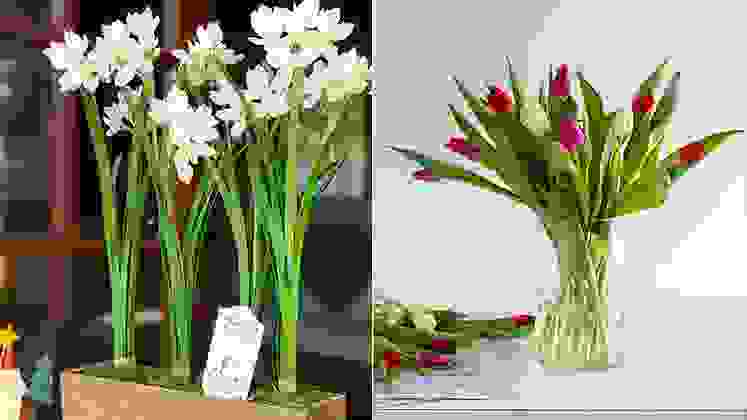 While Trader Joe’s flowers come with a card explaining how to take care of them, if you need more advice or additional details, it’s unlikely any of the store clerks will be able to provide that. Warehouse stores offer high-quality wedding flowers at bargain prices. Sam's Club and Costco have 5-star reviews on their flower sites. If you don’t have a Trader Joe’s store near you, or you don’t shop there often, you'll buy flowers elsewhere. Stores like Sam’s Club and Costco are also well-known for selling high quality flowers economically. 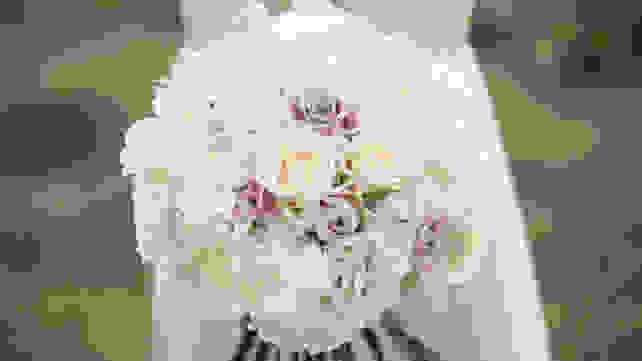 If you're planning a wedding and you need to source wedding flowers on a budget, those stores sell floral packages that are impressive and cheap. Yes, you can create your own bridal bouquet from Trader Joe’s flowers, but if you’re not the DIY type, especially when your wedding is coming up in a couple of days, the warehouse stores might be your best bet. Prices are correct at time of publication, but may change over time.